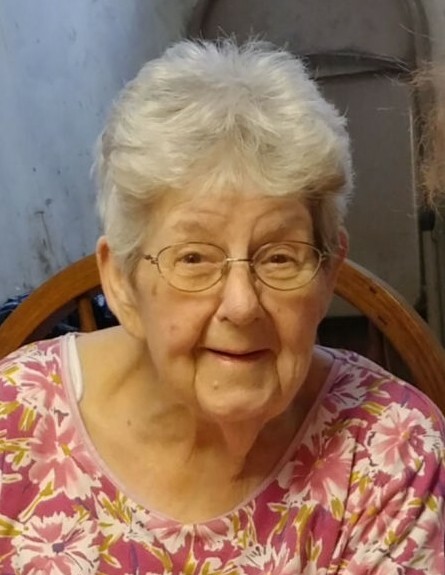 Obituary for Virginia "Jean" Grace (Boyette) Peterson | Stone Funeral Home, Inc.
Virginia “Jean” Grace Peterson, 84 of Petoskey, died April 14, 2019 at her home. Jean was born on December 4, 1934, in Warsaw, North Carolina, the daughter of William and Virginia (Jones) Boyette. She was a graduate of Warsaw High School. Jean grew up working on her parent’s tobacco and cotton farm until she took a waitressing job in Norfolk, Virginia, where she met the love of her life, James Peterson, Sr. They were married on October 26, 1955 in Petoskey, Michigan. Together, they had seven children of their own and Jean was affectionately known as “Ma Peterson” to countless children. Jean loved quilting, hunting for mushrooms, and cooking meals for her big family. She was especially known for her fried chicken, potatoes and baked beans. She was a member of the Women’s Auxiliary of the VFW. She was extremely active with her volunteer work, selling poppies and calling BINGO nights at Bortz and the Friendship Center. She was extremely social and loved to go shopping with her friends. Above all else, Jean will be remembered for being a caring and devoted mother. She taught her children everything she knew and raised them to be adults she was proud of. She is survived by her children, Glenn N. Peterson of Petoskey, William Peterson of Petoskey, Christina Peterson of Petoskey, James Jr. (Penny) Peterson of Wolverine, Leo J. (Jessica) Peterson of Las Vegas, NV., Vincent Peterson of Alanson, and Virginia (Brian) Kay of Petoskey; grandchildren, Michael Peterson, Christopher Stradling, John Kay, Brianna Kay, John Slater, Andrew Slater and Elizabeth Slater; great grandchildren, Danielle Stradling, Emily Simmons, Landen, Olivia, Dylen, Emersen, Rori, RaeLinn Slater, Primrose and Marygold Billings and Arroh Slater; sister, Linda (the late D.B.) Batchelor; sister-in-law, Carol Boyette; brother-in-law, Leo P. Peterson; her beloved cat, Stinker; and numerous nieces and nephews. She is preceded in death by her husband, James; brother, Joe Boyette; infant sister; sister-in-law’s Helen Kabot and Lila Vroman; and a niece, Jeannie Ann Dixon. There will be a visitation at Stone Funeral Home on Tuesday, April 23, from 5:00 – 7:00 p.m. and a Memorial Mass will be held at St. Francis Xavier Church on Wednesday, April 24 at 10:30 a.m., with a one hour visitation prior to the service. Father Dennis Stilwell will officiate. Burial will take place at Curtis Cemetery. For those wishing to make a charitable contribution in memory of Jean, please consider the Brother Dan’s Food Pantry.